My theory is this: The show is both a production-site and graveyard for the relics of an unnamed religion. Members of this cult worship reproduction technology and mass-produced items of any form. I like this theory because it reflects our contemporary experience. 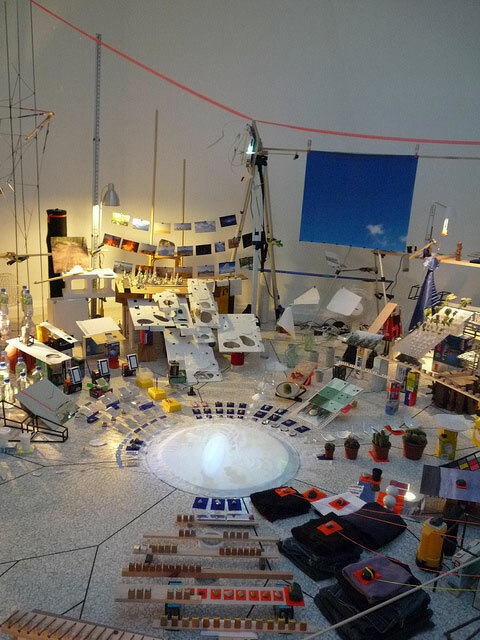 It’s also a hell of a lot more interesting than the concept description which attaches an enormous number of stale Biennale themes to Sze’s work: It engages the history of a building and the colonization of peripheral space. It seeks equilibrium in a chaotic contemporary world. Agreed that an imaginary religion trumps building history and colonization-anything as an interpretive hook. Let's add "Hoarders: The Pavilion," and of course, obsessive-compulsive disorder to the mix. Religion brings form and ritual to chaos, but then there's sorting cacti by size and attaching strings to everything. Normally we think of such activities as something a recluse does, and not a collective enterprise such as organized worship. But then you think, well, Sze can't be doing this by herself at this point (can she?) and imagine a team of assistants lining up piles of consumer discards under the maestro's direction. And thousands traveling across the oceans to see it. Yep, religion.